The HydroDerm is the perfect way to give you the best skin exfoliation and plumping you have ever had systematically in one treatment. Most importantly it is chemical free. It diminishes the appearance of fine lines and wrinkles without the irritation associated with crystals. Which are too harsh for many skin types. synergistically enhances the exfoliation process providing cooling, comfort and a solution of rehydration. For better results and healthy rejuvenation leaving the skin smoother, with a fresh more youthful looking glow. Aquafuse hydrate-normal -dry skin types. Aquafuse acne - oily and acneic skin types. This service provides a cutting edge technology that utilizes low frequency sound waves in a three stage system for safer mechanical exfoliation, molecular penetration and healing micro amp therapy to combat aging skin, reduce wrinkles, clear acne, manage Rosacea, and control hyperpigmentation. No other skin tool exists for ALL SKIN TYPES and CONDITIONS in the esthetic environment or can provide the level of efficacy to improve skin without invasive injury! A Chicago plastic surgeon Dr. DeBartello, conducted studies using the GlyMed Plus Dermasound Elite machine with D2O and distilled water. One thousand patients were employed in this study. The study parameters utilized were split faced, matched pairs and cross over study. The current conclusive research is no less than scientifically spectacular and a breakthrough for skin care specialists everywhere! Microcurrent, with a medically based origin, works in harmony with our body’s natural electrical system. When used in conjunction with specialized products and manual manipulations, these tiny microcurrent impulses trigger chemical reactions at a cellular level to enhance the production of elastin, provide circulatory benefits, and assist in product penetration (iontophoresis). Results enhance as much as 65% in comparison to 10-20%, when products are placed topically on the skin. The result is visible firming and smoothing of the skin. It represents years of scientific research and development in natural skin care. Recent studies, from the University of Washington, demonstrated a 39% increase in natural collagen and a 48% increase in elastin from these anti-aging skin care treatments. Studies have also found a 30-40% increase in protein synthesis and membrane transport and a 500% increase in ATP (the intercellular energy of all our cells.) These allow for the re- education of muscles and contouring of the face, for a revitalized appearance. treatments are recommended for optimal results. A physical, manual exfoliation of the outermost surface of the skin. It is a form of manual microdermabrasion and is often done alone or used in preparation for resurfacing, chemical peels, or facials. It removes the dead skin layer as well as vellus hair (peach fuzz) leaving behind smooth and vibrant skin. 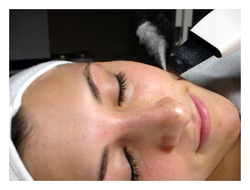 Dermaplaning also helps to improve the appearance of fine lines, minor acne scarring, and to enhance makeup application. Dermaplaning is a simple procedure where a sterile surgical scalpel is gently stroked along the skin at a 45 degree angle while the skin is pulled taught. This is similar to how a man shaves, but because women have vellus hair and men have terminal (course) hair, when it grows back (3-4 weeks) it will remain fine and thin on women. 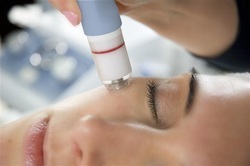 Dermaplaning has no recovery time and can be repeated every 4 weeks. It is safe for all skin types, except active acne and overly oily skin.